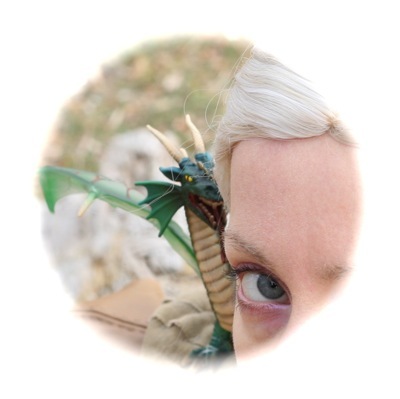 This Halloween Naomi wanted to go as Daenerys Targaryen from George R.R. Martin’s series A Song of Ice and Fire via HBO’s Game of Thrones. The show’s meticulous costuming won costume designer Michele Clapton and her team an Emmy this year. (They even wove their own fabric.) You can see an L.A. Times costumes gallery with Clapton’s commentary here (contains spoilers) and a post with video by Chris Laverty of Clothes on Film here. Ser Jorah Mormont (Iain Glen) and Daenerys Targaryen (Emilia Clarke) in Game of Thrones, Season 2. Photo: Paul Schiraldi via IMDb. The costume was an experiment in pattern drafting for me. I made one element from scratch and adapted the others from a few vintage sewing patterns I had on hand. The outfit consists of a princess-seamed overdress worn with fitted leather armour and over a split skirt. 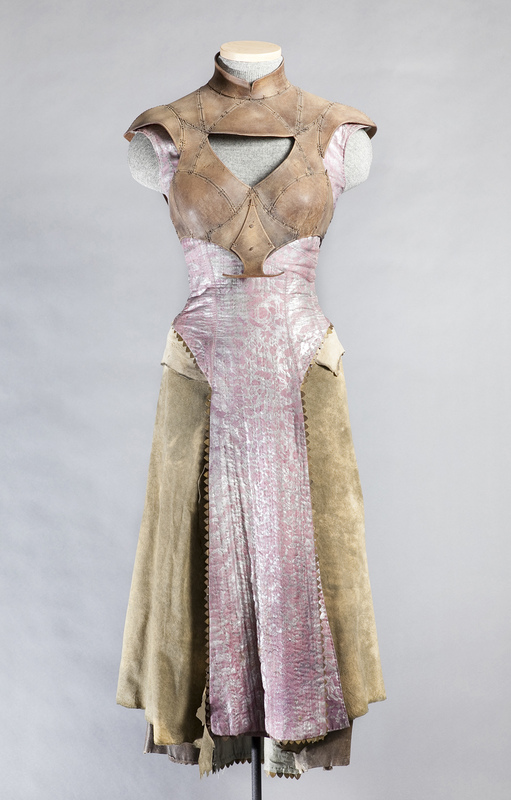 The concept is that the character has paired armour with a man’s tunic from the port city of Qarth, worn over a skirt made of skins from her time among the nomadic Dothraki. Costuming Dany. From Inside HBO’s Game of Thrones (Chronicle Books, 2012). 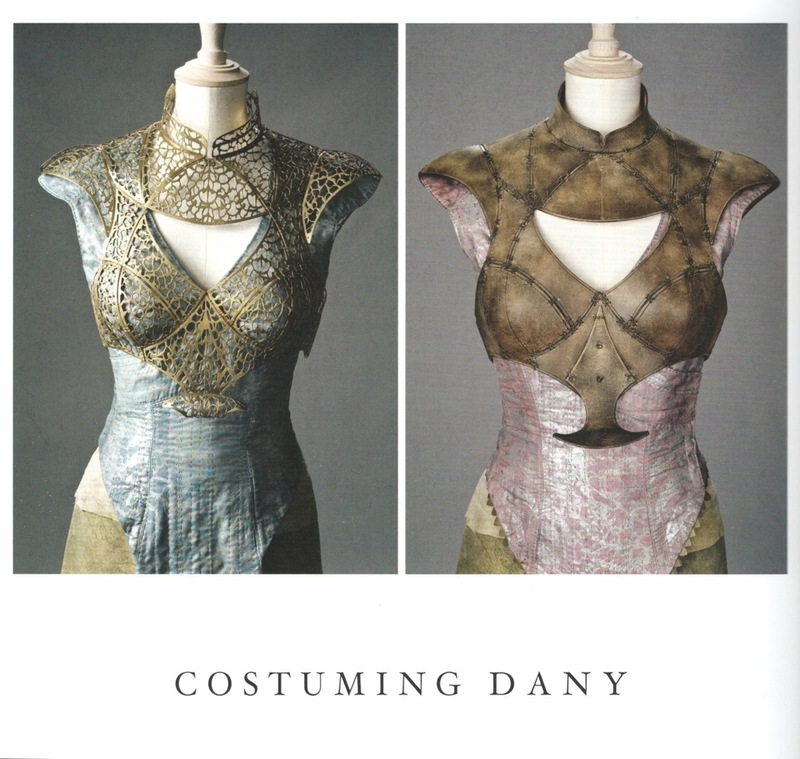 Daenerys Targaryen Qarth costume. Image: Bell Media. For the princess-seamed dress I used McCall’s C-3 with shoulder yokes adapted from Butterick 5059, and the high-collared armour is loosely based on McCall’s 1051. 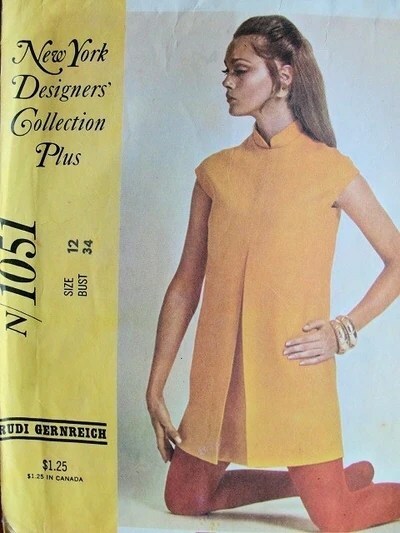 McCall’s 1051 by Rudi Gernreich (1968). 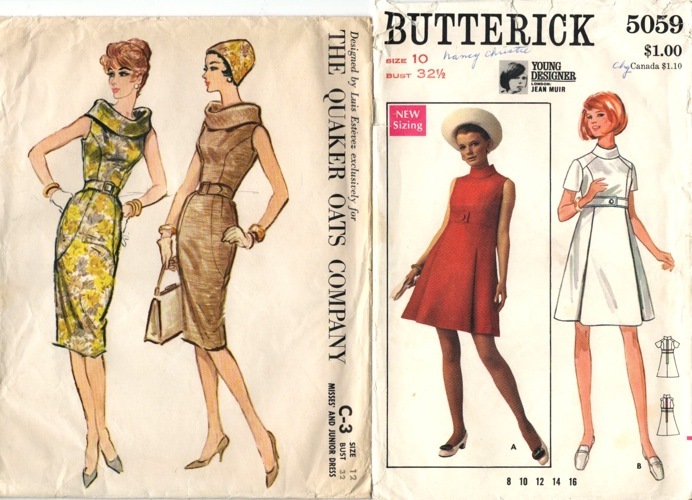 Image: Vintage Patterns Wiki. For fabrics, we managed to hit King Textiles’ big moving sale just before they closed their old location. (The Richmond location’s being demolished to build a condo development called Fabrik.) We picked up some lavender satin for the overdress, the perfect, canvas-backed fake suede and a pale beige woven for the skirt, and some thin brown PVC for the armour, to be backed with a heavy underlining. 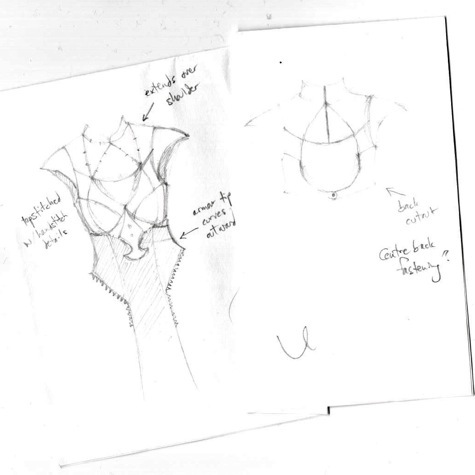 The Dothraki skirt was the most fun to figure out. I cut two hide-like pieces from the fake suede, leaving the edges raw and uneven; the bottom corners curve down to rounded points. For the bleached, folded-over hip yoke I did some primitive draping with tracing paper to get the correct curve on the body. After finding the right amount of overlap for the ‘hides’ I pinned them in place and stitched them to the yoke’s inside edge. The centre back closure is hidden under the overdress. 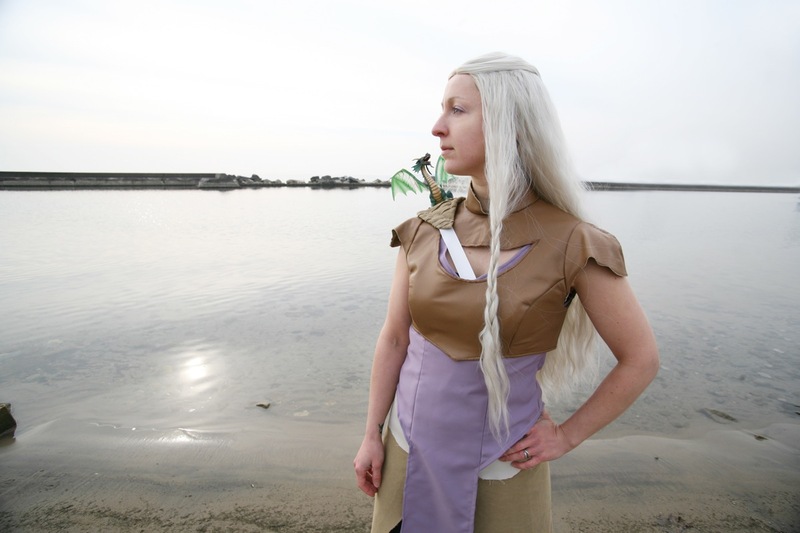 Online videos showed that Daenerys’ Qartheen overdress had shoulder yokes (they’re also visible in the Costuming Dany photos), so I combined my yoke pattern with a princess-seamed dress pattern, cutting away the sides at the hips and slightly flaring the long, central panel in front and back. The original overdress on the show is quite fitted, with topstitching that suggests that it’s boned, but we went for a more relaxed fit. The armholes are finished with bias underfacings; because the wrong side of the central panel shows, I mitered the corners and finished all the edges. The leather armour posed the greatest challenge for me, since for some reason I decided to draft the sleeves without any kind of block. I used the collar and upper bodice from McCall’s 1051 and patched in the princess seams from the overdress, adding a cutout to line up with the overdress neckline. The bodice PVC was backed with canvas, and I used scraps of the fake suede to back the sleeves and collar, leaving the edges raw. The combined PVC/canvas layers were difficult to control in places. Initially I planned to topstitch to mimic the piecing detail of the original, but this PVC does not take topstitching. Instead we bound the bottom and cutout edges with strips of PVC, and I did a quick running stitch by hand on the sleeves to smooth the shoulder line. Add a silver-blond cosplay wig and toy dragon, and the costume is complete. Next: my Halloween costume as Quaithe of Asshai. Hi Sarah, is that you wearing Vogue’s Givenchy 2014? I just searched your blog to see if I’d missed a post about you making the pattern, and I noticed in your disco-patterns post that you were planning to make 2014. Good eye, Dustin! I’ll be posting about V2014 next—I used Halloween as an opportunity to make it. Sarah, these photos made my morning. 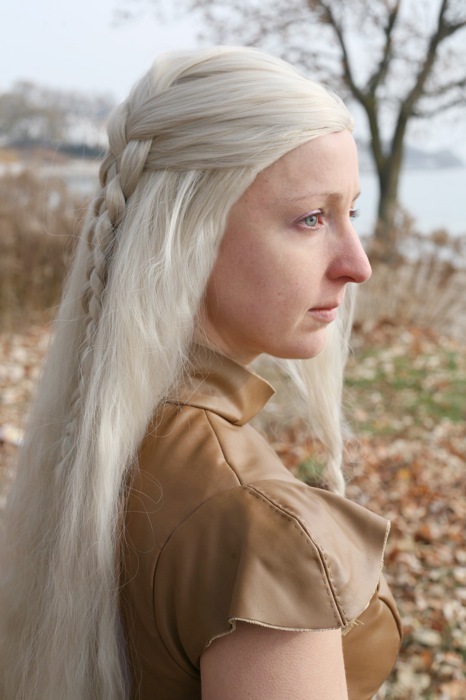 Naomi makes an amazing Daenerys (OMFG THAT DRAGON HA HA HA) and you did an amazing job McGyvering the costume. She’s a lucky lady. Oh, I miss Halloween already…. Thanks, Eva! It’s impressive that you have an entire blog devoted to Halloween. Love this so much! 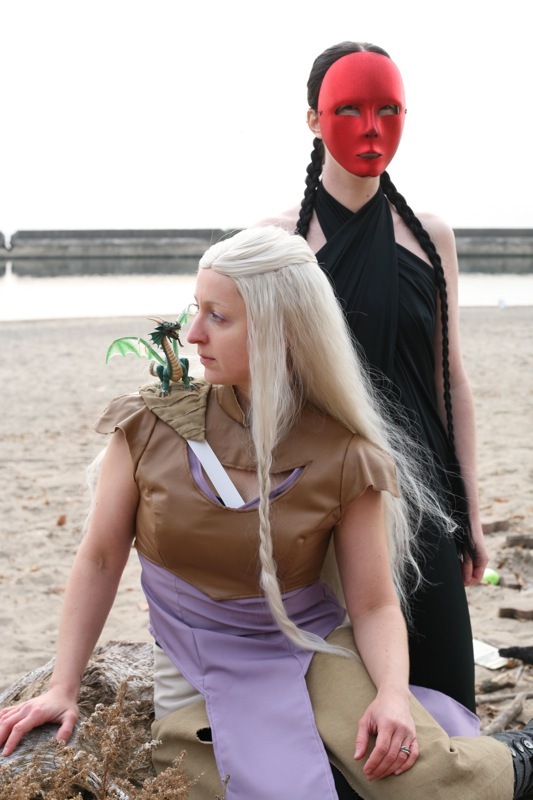 I’m going to try for the other Qarth dress in that photo and you’ve given me a lot of ideas. Thanks!!!! Thanks, Lorina! Good luck with your costume!